A view of the Timber Lodge at Shekinah Retreat Centre. Photo Credit: David Cheatley. 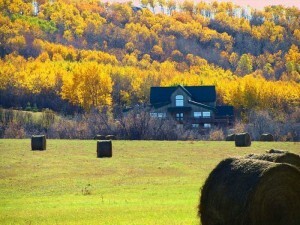 On Thanksgiving weekend, a group of about forty Friends gathered at Shekinah, near Saskatoon. On Friday, as people arrived, we gathered downstairs and ate the delicious food generously supplied by members of Saskatoon and Prairie Monthly Meetings. We enjoyed an activity in which we paired up and drew our partners without looking at the paper – a challenging but ultimately amusing task! We then learned interesting facts about our partners and wrote them side by side with the portraits. At Saturday’s Meeting for Worship for Business, we heard the joyful news that two Friends had become engaged that morning. Saturday was a beautiful warm day, perfect for the popular Flying Fox zip line. Friends young and old put on helmets, hooked up their harnesses, and flew across the small valley and back. More cautious Friends watched and cheered. Later on Saturday afternoon, we were able to choose between two Special Interest Groups: Quakers in a re-tribalized world; or the feasibility of continuing to meet at Shekinah. Saturday evening was clear, providing an amazing view of the stars that can only be found in the country. Coyotes yipped as we gathered to watch a white aurora borealis veil the northern sky. On Sunday afternoon, our guest from Burundi offered a SIG that expanded on her Saturday evening talk. Family Night took place Sunday evening in the building’s cozy chapel. The acts included poetry, storytelling, music, and an adorable animal skit from our youngest Friends. Monday morning, after a short Meeting for Worship, we sang a familiar old song that concludes many such gatherings, and then the new-to-us song we learned from our guest from Burundi during Family Night. *Her name has been omitted for privacy purposes. A video of Alastair McIntosh’s Sunderland P Gardner presentation, Decolonizing Land and Soul: A Quaker Testimony, is now available in our Audio & Video section through Vimeo. Or use this direct link. While he was with us in Charlottetown, Alastair also offered to share the PDF version of his book Island Spirituality, which you can download here.